We had a small stroll tonight at the Ritz, and it was definitely a lot of fun. Waking up at noon made 19:00 seem early, and I was wired. Afterwards, some of us went to Kaldi's and hung out there. Oh, and a huge storm rolled in. It's been a very long time since it's rained this hard. I even had to turn off my headlights cause there was too much reflection off the raindrops. Woah! 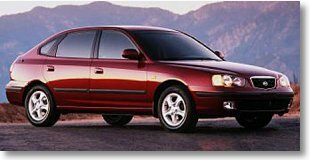 Forget Daewoo, I thought that was good value, then I realized what $13999 can get you in terms of the Elantra GT. When Hyundai dumped the Elantra wagon, I was pretty dissapointed, but they obviously had something better up the sleeve. And as a good marketing move, it's not called a wagon, but it's new extremely slanted hatch passes it for a 5-door hatchback anyways. The look reminds me very much of Saab. But there's a ton of room! 28.3 cubic feet puts it even above the Subaru Impreza (which they sharnk for 2002, argh) in terms of trunk space. The package is as agressive as ever. It comes with standard A/C, 15" alloy wheels, 4-wheel disc brakes, keyless entry, fog lamps, power and heated (!!) mirrors, rear wipers and washer, side-impact airbags (!! ), power steering, locks, windows, a CD player with 6-speaker sound, and leather interior (seats, steering wheel, and shift knob) (!!). The $1175 "Package 7" is a must, adding ABS and a Power Moonroof with a sunshade. The engine is a 140bhp 2.0L I4, producing 133 lb-ft of torque. It looks extremely sporty on paper, and should be an awesome drive for the price, with the sport-tuned suspension and all. It's a good $2300 cheaper (with the package) than a Subaru Impreza wagon, and definitely has become my favourite cheap wagon/hatchback. 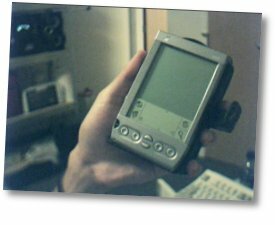 I took advantage of the now $199 price of the Handspring Visor Platinum, and ordered two. One for me, and one for Dad, and Mom will use my old Deluxe. It's pretty cool, it wasn't an essential upgrade, but while my parents wanted PDAs, might as well pay the extra $30 for the Platinum. But it's good to know that I haven't been missing all too much, cause it's 50% faster, but since the Deluxe wasn't exactly slow, it's not like it's very noticable. I must have been tired and not very crisp at sight-reading last week, cause this week at Wash U Symphonic I felt a lot better about it, like it was a lot more managable, and the music is starting to grow on me. Maybe I can do this and Youth Symphony cocurrently after all. So I was coming back from rehearsal at the West Campus, and I had to make a sudden lane change right before the intersection right out of West Campus. I forgot that I couldn't get on Forest Park Parkway East from the Ritz. Well anyways, this little maneuver bothered a cop in an Impala (I want to say U-City, but most of the incident occured in Clayton, so it was probably Clayton) and he started tailing me. I even detected a radar, and I traveled the speed limit the whole way. He tailed me until I got to Forsyth and Big Bend, and then he pulled me over, asking me why I was "driving crazy". Asking him what he meant, he could only explain the one maneuver in front of West Campus, and quickly ran out of words, but then added a ridiculous comment about how the speed limit in 20 in a school zone, even at night. I gotta keep that one in mind. Typical cop trying to scare young driver situation - he decided he had no solid reason to give me any sort of citation, and then said "Good thing you're wearing your seat belt" before he let me go. Owell, this wasn't too bad, no harm done, he was just checking on suspicious driving, so it's all good. Oh my gosh, my arms have turned into a bug bite museum. I have a ridiculous concentration of various bug bites of different sizes, shapes, and colours, and they change and turn different colours (like pink and white) all day. I think I haven't climbed trees in a while, and so something living on the barks probably caused my body to freak out, and it's reacting really badly to it. It's pretty ridiculous. Today was Hannah and and I's Day. We had a picnic lunch in a tree, which was really really fun. We did other fun stuff too, like draw, edit audio files, burn CDs, watch the Matrix, solder stuff. Went shopping again today, so that was cool. I had a dinner picnic with Joe, Hannah, and Laura in Forest Park. It was a really great day to have a picnic. At night, I went down to the Esquire to see American Pie 2. It was what I expected, but still pretty funny, taking it for what it's worth. I did laugh a lot through it, though it's nothing of high enough quality to remember it for very long.